In order to keep these actions under complete control while fully automating their display in the lists of active actions, there is a flexible setting of recurring tasks in MyLifeOrganized. The main purpose of recurring tasks is to periodically remind us of our obligations within the preset days and times. In GTD it is called "areas of responsibility". This may concern both professional activities (like frequency of report submission, tax payment, inspections, personnel training, as well as planning for the next week) and personal sphere (payments, cleaning, checking child’s homework, going to the gym etc.). Next, we will consider all the options for recurring tasks in MyLifeOrganized which can and should be applied in practice. 1. Main options. The mandatory ones, without them the task recurrence will not work properly. They determine the frequency and order of task recurrence. 2. Additional options. More fine-tuning options for advanced users. Start and due dates may be the same. For example, for the task "Send a Valentine's Day Gift" the start and due dates will be set as of February 14, because it is too early on the 13th, and on the 15th is somehow too late. Dates may be different too. For example, you need to pay utility bills before the 20th of each month. But it is not necessary to do it on this day. You can set the start date from the 15th of each month. Restriction on the number of occurrences. You have to take vitamins for 14 days. Set recurrence for daily and specify 14 days. The task will be reminded of every day until you complete the task the specified number of times. In the meantime the properties will indicate the number of occurrences left. “End by” limit. Suppose you have bought an annual subscription to the gym. You create a recurring task, for example, on Monday-Wednesday-Friday. And for the same task, you can specify that this mode is maintained until the date this subscription expires. Unless, of course, you are going to renew it regularly. If you are an experienced user of the MyLifeOrganized task manager and the suggested recurrence options are insufficient for you, there are additional options. These options are used to substantially extend the functionality of cyclic tasks. 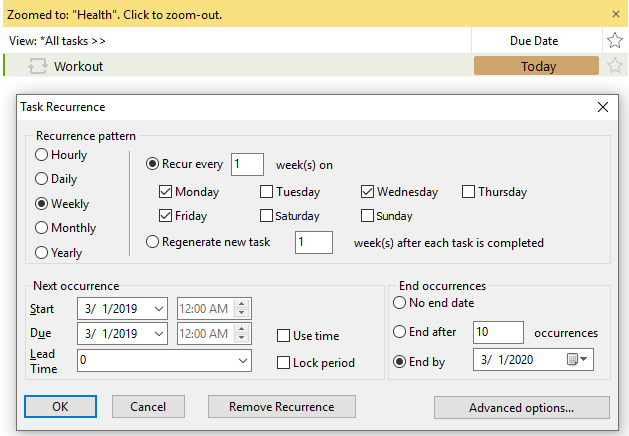 In MyLifeOrganized recurring tasks can have their own subtasks, which, according to a given algorithm and settings, are repeated or not repeated together with the main task. 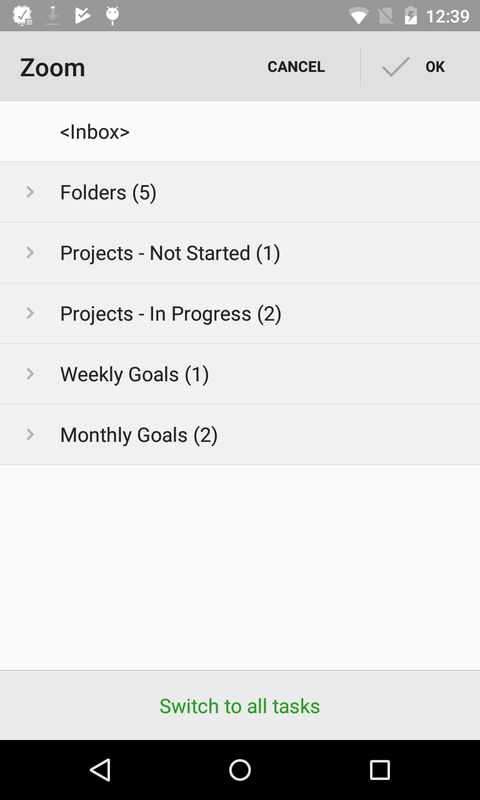 If there are subtasks for a recurring task, you can set how the system should deal with completed subtasks, when to display them next time. 1. Disable automatic reset. All completed subtasks of a recurring task when transfered to the next repetition remain completed. Example of application: there is a recurring task "Meeting". 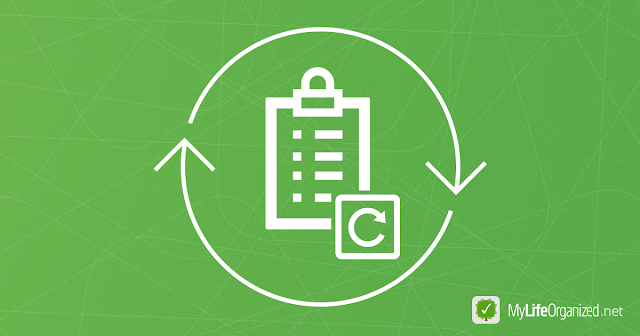 The issues on the agenda that need to be addressed or discussed have been added as subtasks. All the solved issues (subtasks) remain in the system as completed and will not be displayed during the next display. After the completion of the “Pay utility bills” task itself, all types of payments become active again. 3. 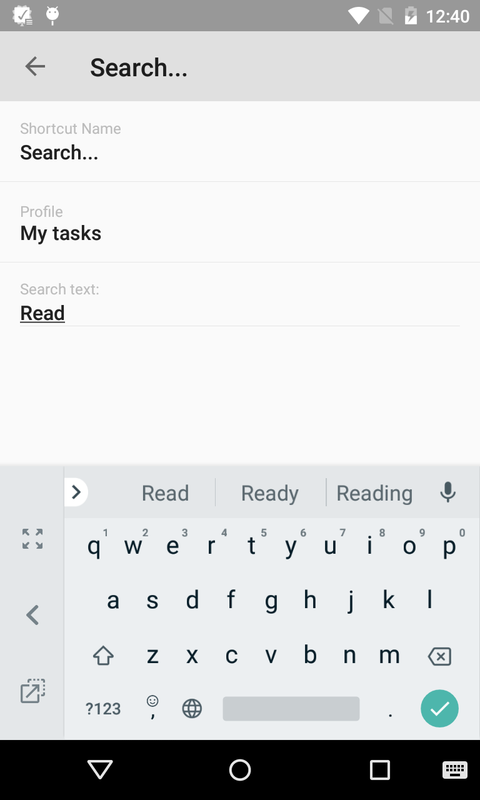 Reset all subtasks to uncompleted, if all subtasks are completed. For which purpose can this be applied? For the most flexible approach to periodic tasks. 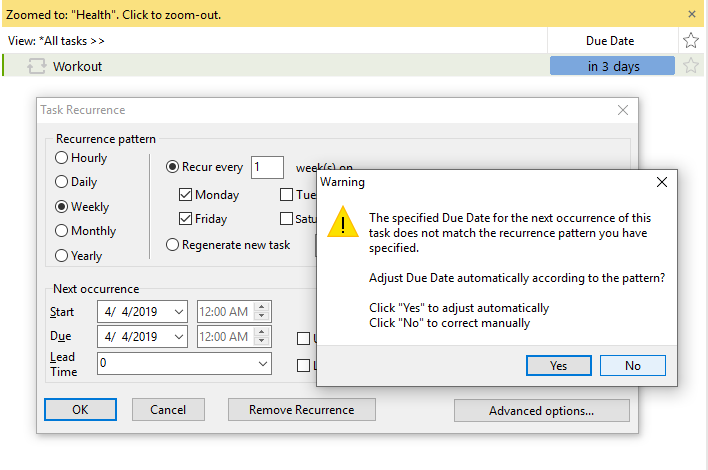 You should set “Reset all subtasks to uncompleted, if all subtasks are completed” and “Do not create a completed copy of this task on recurring” (to be described in the next chapter). At the completion of any subtask, the next time you will be shown only the remaining three. Then two. And so on until you complete all sets. After the last subtask is completed, all workout options will be available again in the next recurrence. In MyLifeOrganized, recurrence can work not only after the completion of a recurring task, but also after completing its subtasks. 1. Disable automatic recurrence (set by default). It does not matter which subtasks are marked as completed. Recurrence will work only after the main task on which the recurrence is set as completed. 2. Automatically recur when any subtask is completed. It’s convenient when choosing among a variety of options. When you complete any subtask, the parent task is considered completed and recurs. 3. 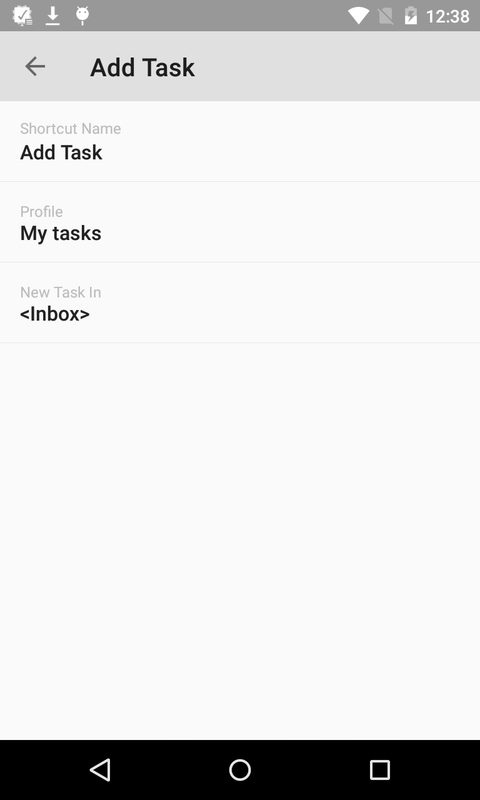 Automatically recur when all subtasks are complete. It is effective to use if the recurring task itself is generalizing and serves only to unify the tasks of the same type. For example, this may be the task “All taxes paid!”, where the subtasks are a list of all taxes due for payment. When everything’s paid automatic recur will work, without the need to complete the main task. There are no restrictions in MyLifeOrganized that you can use only a specific automatization option. Instead, from the options described above you can create any combination you need for each specific case. For example, the periodic task “Personnel training”, for which it is necessary to conduct classes on various topics with a certain frequency. How can this be useful? When the time comes to conduct classes, we can choose any topic that is most relevant at the moment. At the completion of the subtask, the recurrence will work. But the next time the task is displayed, all the topics will be shown, except for that already studied. After all the subtasks are completed, you will see the entire list again. For a recurring task you can specify whether to create a completed copy or not. You can skip the occurrence either by clicking on the task with the right mouse button with the choice of the corresponding function, or you can assign the hotkey to skip the occurence in the settings and perform it using the keyboard. Skipping the occurrence is especially useful during the evening review of tasks for tomorrow. 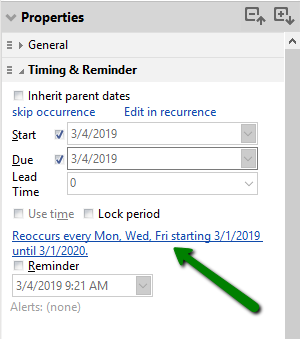 If we see in advance that we will not be doing some tasks tomorrow, we can move them to the next relevant date, not waiting for them to become overdue. It is necessary to stick to some rules so that working with recurring tasks would be convenient and would not give failures. If you have set the date of the next occurrence with a weekly pattern, this date must correspond to the specified day of the week. If there is a discrepancy, the program will warn you that this day is not, for example, Tuesday. In this case, you can accept the suggested option of auto-correction or manually change either the date or the day of the week. The similar thing is with monthly and yearly recurrence patterns. For example, if the date is set on the 1st day of the next month, and the recurrence is “every first working day of the month” - this date should be exactly the first working day of the month. The recurrence with the “Regenerate new task...” on will occur exactly within the specified period after the task is completed. If you take this example, the first time the reminder will work at 3 p.m. And if you click to complete the task at 3:24 p.m., then the next reminder will work as early as 3:24 p.m. of the following day. You should set time and reminders only for tasks with the recurrence of every day, week, month and year. 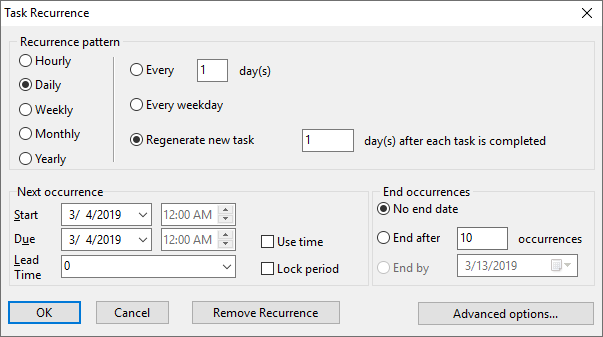 Please note that in the “Hourly” pattern the only option we can set is “Regenerate next task x hours after each task is completed”. The options for task recurrence in the MyLifeOrganized task planner are able to reflect any life situations, any cycles with all sorts of corrections. Should your situation not fit into the possibilities of MLO recurrence, write about it in the comments — we will discuss it and find a solution! Views are now enhanced with two cool options in your Android task manager MyLifeOrganized. Let us start with the first one, it is called “Views update mode” and can be found in MLO settings. By default, as soon as you change the task so that it no longer corresponds to the current view, such task immediately disappears from this view. For instance, this occurs when you remove a star from a task in the “Starred” view or complete a task in the “Active Actions”. However, quite often it is necessary to make several changes in one or several tasks, and only after that update the view so that these tasks could disappear from the view or new tasks added to it after these changes. In other words, it would be better to control how fast to refresh the view with tasks. And this is what our new feature is about. Thus, the view update mode settings allow us to update views either automatically (i.e immediately after the change, as it worked before this update) or manually (when you made all planned changes in the current view and ready to update it). Now in detail. First, we tap off the automatic update in the “Views update mode” settings. After that, we remove a star next to the task. The task does not disappear from the view of Starred immediately as it usually does, instead we see the current view name with a small asterisk before it. This asterisk signals us that we have made some changes to the tasks and the current view may be not up to date anymore. We can edit the task's properties and once done we tap at the top panel. Finally, the view is updated, removing the unstarred task from it while the asterisk disappears. Tip. When dealing with the automatic mode, it may also be useful to tap for the “delay view update” option, which would mean that you will have time to tap several tasks before the view is updated. Thus, its update would be less abrupt. Besides, we can choose the update mode for each single view. In this case, each view can be configured separately with three suboptions, namely “Use profile setting” (which is default), “Automatic” and “Manual”. This means that you can set one view to update manually and another to keep the automatic updates as before. This creates an unlimited space for configuring your own complex MLO planning systems and profiles. To start with, you may configure the “Active actions” view to be updated manually, so that, after completing a task, such task would not disappear immediately, but leave some time for considerations and final review. At the same time, you may keep the “Starred” view in automatic update as before since you usually need this particular view to refresh immediately after your change. Thus, each of your current decisions would be ultimately precise and accurate. Using the second feature, “Switch view on the click”, we no longer need to switch a view only by using the main menu, but we can opt for a single tap at the top panel with the current view name. Therefore, for example, after tapping the asterisk in the manual mode, we can immediately proceed to another view by clicking the header the second time. This makes our experience of the view update brighter and saves lots of time when we need to be at top speed. Finally, both features complement each other and your interaction with the app will be twice more effective. Tip. The Pro version is required to use these features. 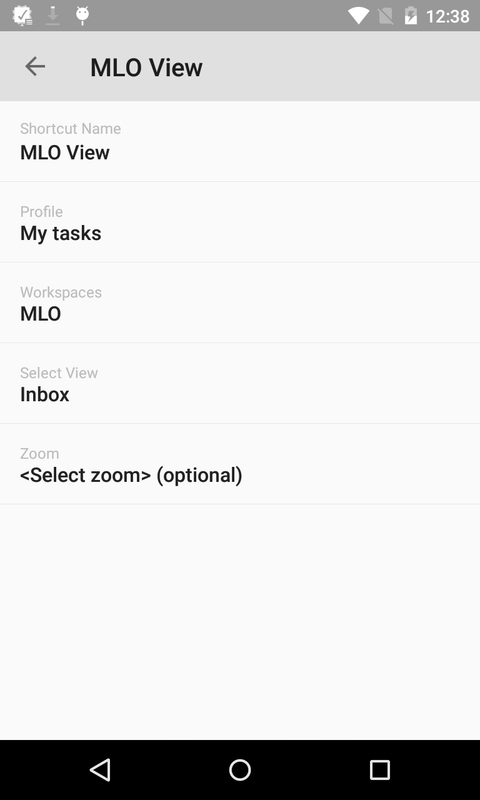 Today we are going to tell about a minor, but really wanted feature for MyLifeOrganized 3 Android task manager - flags in your widget. This update is pretty handy both for people who enjoy using flags and for those who just plan to use them in future. We are sure you’ll enjoy it. Please share your thoughts with us as well! 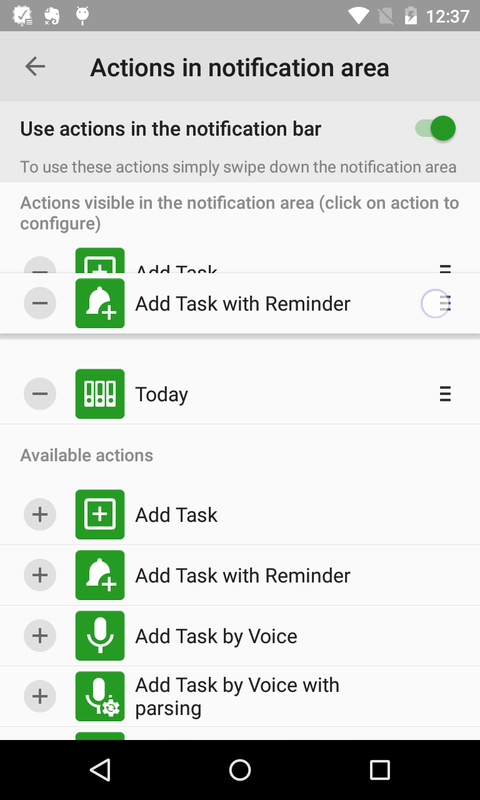 One more handy feature is now out in your Android task manager MyLifeOrganized - Promoted Action or Floating Action Button. So what is the purpose of this button? As a rule, it takes some time to reach frequent actions, and to select them in the bottom menu requires several taps. What is the solution if we process several or even multiple tasks? As you may guess, this is the Floating Action Button, which allows to perform an action with one tap. Promoted action is now on by default, so you will notice a green circle on the task list screen. Tip: If you decide to turn off the promoted action button proceed to Settings –> General Settings –> Promoted action. Note. There is one point you may notice: the Promoted action button disappears after you scroll the list to the bottom. This was designed to ensure that the button does not obscure the task and its properties, such as flags and stars, and does not prevent you from managing it. The button will reappear if you start to scroll up. So, basically Promoted action is the button of the most frequent action. In other words, its main function is to represent the action which is used most frequently among the list of featured actions. In most cases it is the “Add task” action, but you can choose any action you use the most. Tip. The pane being open, use long tap again with the cross to configure selected Promoted actions. If you long tap again you will be switched to the configuration of the Promoted Action button. Let us consider its settings in detail. First, you can configure the list of selected actions by moving them from the “Available actions” with a plus, and move back by tapping a minus. This creates a huge space for imagination — you can configure and choose your own combinations, as well as plan complex tool panes. Please mind that the number of actions shown depends on the size of your screen, so you will see only the first several actions from the list after you long tap the floating action button. Tip. When dealing with any promoted action from the pane, the main green button memorizes your last choice. We have no doubts that you’ll duly appreciate this new feature and accelerate your interaction tremendously. Just try it yourself. Please share your impressions with us as well. Tip. You would need to run the Pro version to use this feature. 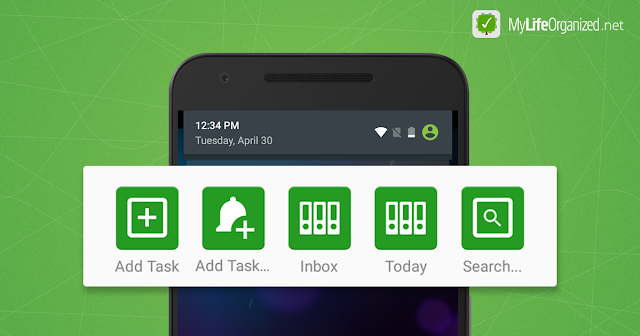 Today we are going to describe another handy feature for your to do list app on Android – toolbar configuration! Why would we need a toolbar? It is true that being a sophisticated solution with multiple options and features MyLifeOrganized provides us with a lot of opportunities and appliances. However, some of them are often more necessary than other, so we may need to perform some of the actions quickly and regularly. So now you can place such actions to the free space on the bottom toolbar pane. Let us consider this feature in more detail.To start with, you may open the settings using a long tap on the toolbar or use the settings (General Settings -> Toolbar Settings). Here you will see the list of available actions which can be configured to be added to the actions visible in the free space on toolbar. Tip. The description of an action can be viewed with a long tap. Tip. You need the Pro version to use this feature. Don’t hesitate to try this feature to improve your personal productivity and interaction with the app.